Farmhouse style home decor, large and small, for gift giving or finishing off your own shelf, mantel, or tabletop vignette! We love the juxtaposition of contrasting materials and texture for visual interest - mercury glass, jute fiber, chicken wire, rusty metal, pressed glass, reclaimed wood, and willow twigs to name a few favorites! 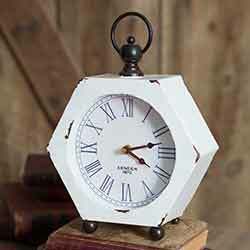 Make an instance centerpiece or mantel display with this rustic wood spool candle holder, painted a distressed white. This is for the Large size. 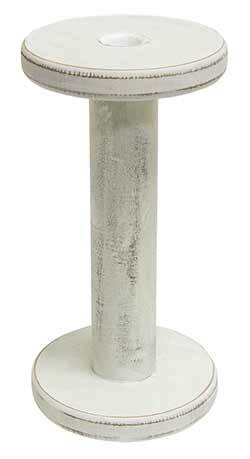 Make an instance centerpiece or mantel display with this rustic wood spool candle holder, painted a distressed white. This is for the Medium size. 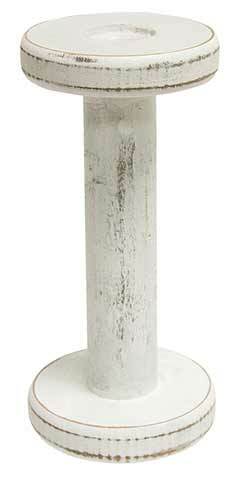 Make an instance centerpiece or mantel display with this rustic wood spool candle holder, painted a distressed white. This is for the Small size. 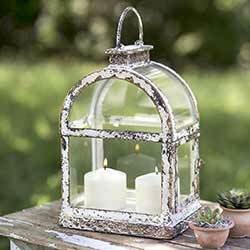 This vintage style lantern is distressed white with a chippy paint effect, perfect for cottage or farmhouse style decorating, for a wedding, or a patio table. 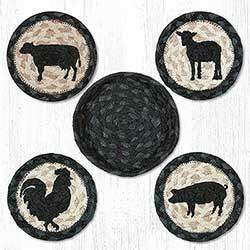 Barnyard Animal Braided Coaster Set, by Capitol Earth Rugs. Features stenciled farm animals - sheep, pig, chicken, and cow! Braiding is in dark muted blacks / greys and tan. 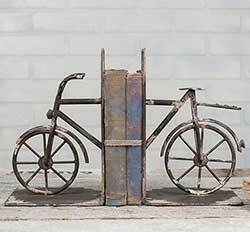 Secure a stack of books or magazines on your shelf with this set of iron bookends, featuring a trendy bicycle motif. 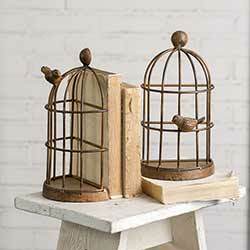 orral books in your living room or office while adding a vintage style look with these birdcage book ends! This vintage style wall hook is distressed blue and ivory with a chippy paint effect, perfect for cottage or style decorating. 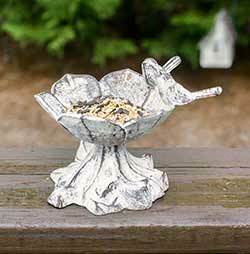 Perfect as a small bird bath or feeder, this cast iron daisy flower figure will add shabby vintage charm to your patio or garden display! 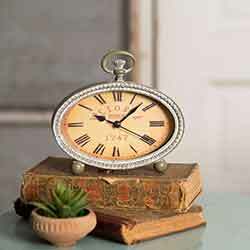 Can also be used indoors with candy, jewelry, or keys. 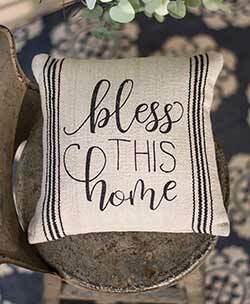 Perfect for a country farmhouse home decor look, this toss pillow features modern typography and grain sack striping in a black and ivory color palette, and rustic fabric. Reads: Bless this home. 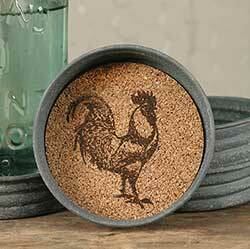 Made from distressed metal mason jar lid, these coasters read "bottoms up." Set of 4. 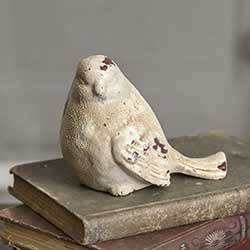 Perfect for your home or garden, this cast iron bird figurine has a distressed white finish. Made from distressed metal mason jar lid, these coasters read "cheers." Set of 4. 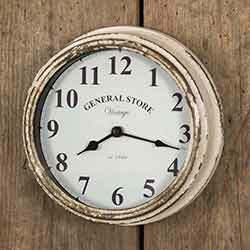 Set this by a hutch, sofa table, or fireplace, for a vintage decorative touch! 20 inches tall. 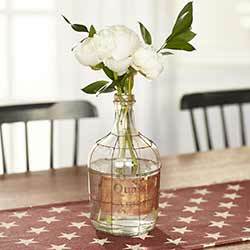 Set this glass jug on a table as a centerpiece, sofa table as a backdrop, or stage by a hutch or fireplace, for a vintage decorative touch! Made from distressed metal mason jar lid, these coasters read "happy camper," with a vintage style camper image. Set of 4. 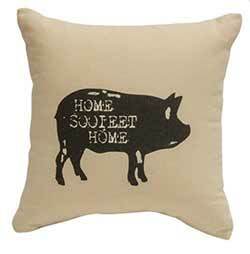 Perfect for a country farmhouse home decor look, this toss pillow features a quirky play on words: "Home Sooieet Home." Pig imaged printed in black on a natural canvas fabric background. 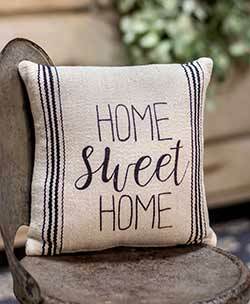 Perfect for a country farmhouse home decor look, this toss pillow features modern typography and grain sack striping in a black and ivory color palette, and rustic fabric. Reads: Home Sweet Home. 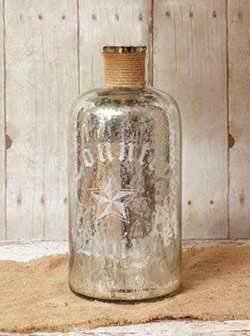 Large Mercury Glass Bottle - Decorate with the elegant, timeless look of distressed silver mercury glass, with this oversized "Country Living" bottle! 11.5 inches tall. Special Order. 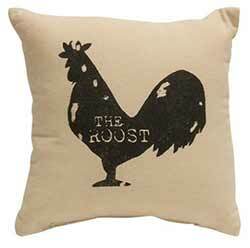 This pillow is made of a rustic oatmeal colored fabric printed in black. 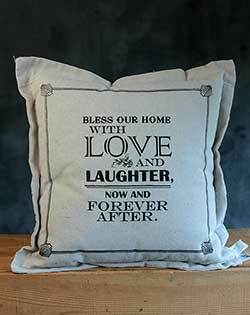 Reads: "Bless our home with love and laughter, now and forever after." Made from distressed metal mason jar lid, these coasters has a vintage style mason jar logo image. Set of 4. 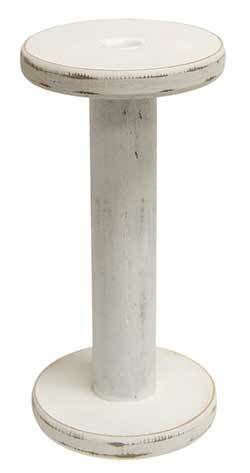 Mercury Glass Vase With Chicken Wire, by Olivia's Heartland. 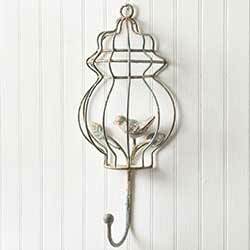 Beautiful antiqued silver mercury glass decor with chicken wire hanger. Special Order. 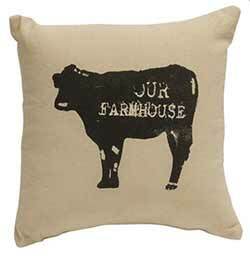 Perfect for a country home decor look, this toss pillow features a cow imaged printed in black on a natural canvas fabric background. Reads: "Our farmhouse." 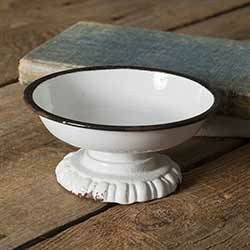 Use this versatile black and white pedestal dish to corral jewelry or keys, display potpourri, or create an instant centerpiece by pairing with a pillar candle and floral ring. 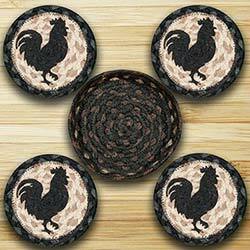 Rooster Silhouette Braided Coaster Set, by Capitol Earth Rugs. Set includes 4 coasters with stenciled design, and a matching braided basket. Made of 100% dyed natural jute. Spot clean only. 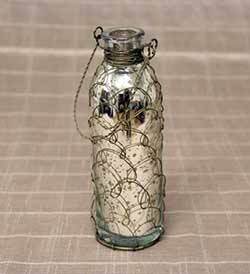 ear glass jar with embossed design inspired by vintage mason jars, great for displaying florals, corralling office supplies, or decoration! Add mood lighting to your outdoor patio, evening entertainment, or hang for a wedding! Hangs or sits. 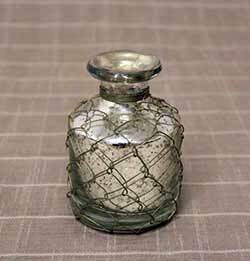 Small Mercury Glass Vase With Chicken Wire, by Olivia's Heartland. 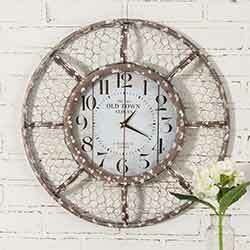 Beautiful antiqued silver mercury glass decor with chicken wire casing. Made from distressed metal mason jar lid, these coasters read "Sweet Tea." Set of 4. 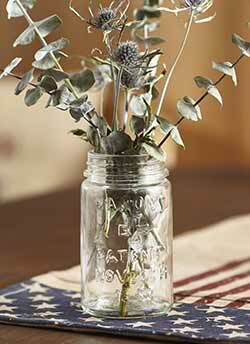 Perfect for displaying LED branches, cotton boll sprigs, or farmhouse floral picks, this rustic metal container is fashioned in the style of an old milk can! 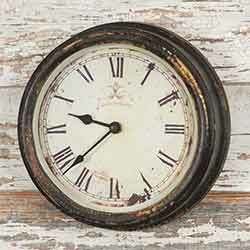 Features a distressed finiah and oval shape - clock face reads Victoria Station, 1747.